A new type of homeless shelter is opening up in San Francisco’s Mission District in the coming weeks, one that city officials say can accommodate those who have stayed out of shelters because they didn’t want to be separated from a partner, friends, or even their dog. The Navigation Center, located at a temporary location at 1950 Mission St., adjacent to the bustling plaza at 16th and Mission streets, is comprised of single-story buildings with dormitory-style living quarters, shower and bathroom facilities, laundry facilities, counseling offices and a 24-hour dining room. The city has also created a place where dogs can be kept and visited by their owners while they are residing in the center. Located on San Francisco Unified School District property that formerly housed Phoenix Continuation High School, the center consists of newly renovated buildings and a large courtyard. San Francisco Supervisor Jane Kim described the Navigation Center today as an oasis where homeless individuals and groups would be able to come to get their immediate needs met and receive one-on-one counseling, with the goal of creating stability in their lives. 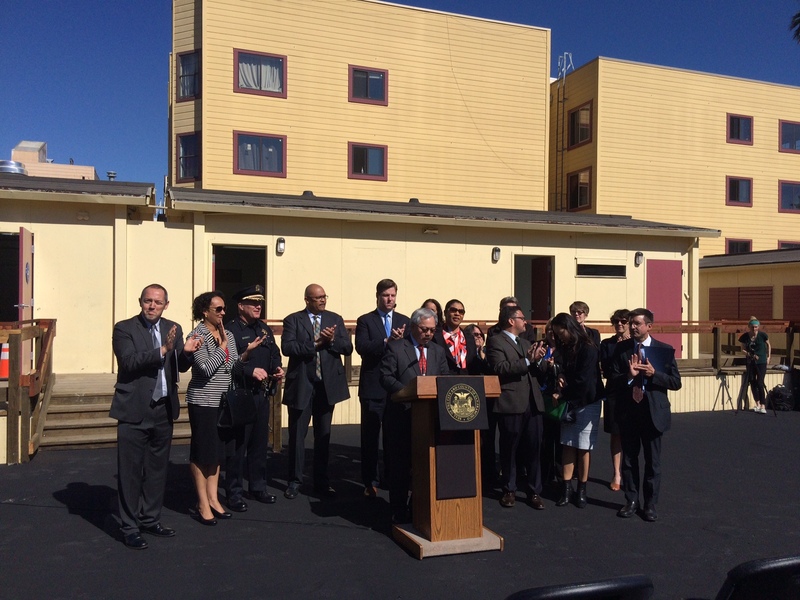 San Francisco Mayor Ed Lee said the Navigation Center is a pilot program and would be the first-of-its-kind. He said he believes it has the potential to help those who face obstacles in obtaining long-term housing. Lee said that the center will help individuals access Homeward Bound, a city program that buys individuals a bus ticket home, or, if the individual wishes, connects them with social services and long-term housing options. A $3 million donation from the San Francisco Interfaith Council will fund the first year of the center, according to the mayor’s office. About $1 million has been set aside to lease single room occupancy units, or SROs, around the city for those who successfully transition out of The Navigation Center. The center is anticipated to open the week of March 16 and remain operational for 18 months. Following those 18 months, Lee said construction on over 100 affordable housing units, as well as middle-income and market-rate units, would begin at the site. Lee said the city’s Human Services Agency and the Department of Public Health, as well as other city departments, will be incorporating their services into the center. Lee said that substance abuse and psychological issues can also be addressed at The Navigation Center and that those individuals will be referred into treatment programs. “It’s not about moving people off the corners,” Lee said. Instead, he said the program is about finding those people homes where they can feel secure. Public Works director Mohammed Nuru, whose staff spends many days cleaning up encampments, oversaw the design and construction of the new complex. 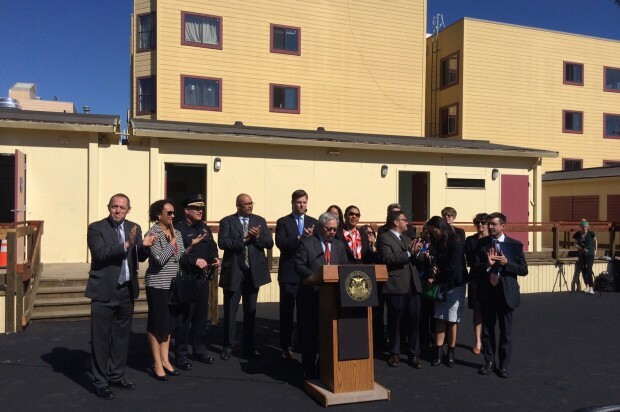 Nuru gave city officials and the public a tour of the new space and noted that the bungalows, as he referred to the modular buildings, could, after the 18-month pilot program, be picked up and moved to a new location. Bevan Dufty, former member of the San Francisco Board of Supervisors and the current director of Housing Opportunity, Partnerships and Engagement (HOPE) in the Mayor’s Office, said Mayor Lee will be meeting with HOPE, the Department of Human Services as well as the City Controller’s Office on a weekly basis to oversee the program. Dufty said the center would start small at first, with the city’s Housing Outreach Team (HOT) bringing in only a few individuals and groups in need of services. In time, Dufty said up to 75 individuals would be able to stay at the navigation center at once. Trent Rhorer, the executive director of the city’s Human Services Agency, said that many of the details of the navigation center, such as curfews, re-entry policies, and housing assignments, are still being ironed out, but that the campus is meant to be a place to shelter all those who, for whatever reason, can’t or don’t go into shelters at night. He said if a group from an encampment wants to sleep in tents in the courtyard together, that’s okay too. “For every reason people don’t want to come to a shelter, we are going to try to accommodate them,” Rhorer said. San Francisco Supervisor David Campos said he believes the center is a sign of change in a city where he has witnessed a move to criminalize the homeless population, with laws being passed to prohibit the homeless from sleeping in parks and on sidewalks. San Francisco Supervisor Mark Farrell said today that he too sees the center as a message to the homeless community and the whole city that the status quo is no longer acceptable. “These are our mothers and our fathers on our streets, our brothers and our sisters,” Farrell said.